New Suzuki SUV to rival Nissan Qashqai | What Car? Suzuki is planning a major overhaul of its current line-up for the UK, a senior source has told What Car?. The majority of its models will be updated or replaced over the next couple of years. Perhaps the most significant of these will be the new SX4 crossover, which is expected to go on sale next year. 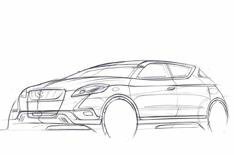 Suzuki has released a teaser image of the S-Cross concept car, which will be revealed at the 2012 Paris motor show in September. This will give an idea of what the next SX4 will look like. The new SX4 will be larger than the current model and is designed to rival cars such as the Ford Kuga and Nissan Qashqai. Suzuki carried out suspension testing for the Swift and Swift Sport on roads around North Yorkshire, but it hasn't confirmed whether similar tests will be used for the new SX4. Although it's roughly the same size as the new SX4, the Suzuki Grand Vitara will remain on sale as a more rugged alternative. A face-lifted version is also due to be unveiled at the 2012 Paris motor show, before it goes on sale in early 2013. Top-spec Grand Vitara models will be fitted with sat-nav as standard a first for Suzuki. The navigation system is expected to become available for other Suzuki models, too. An updated Suzuki Jimny will also be at the Paris show. The changes are expected to be limited to minor cosmetic tweaks, despite the model being on sale largely unchanged since 1999. Suzuki says that sales remain steady and that customers have requested that any replacement remains lightweight and simply engineered. A new Alto city car is also expected within two years.